If I had realised The Prophecy of Bees by RS Pateman was the same as author as The Second Life of Amy Archer, which I read last year, I would not have started reading this novel. 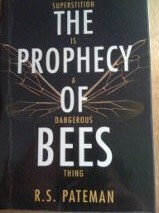 However, I chose this book because I like bees (and honey). Unfortunately, the title led me astray. I didn’t even notice the author’s name. 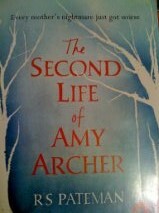 I didn’t enjoy The Second Life of Amy Archer because the ending was ambiguous and the characters left me cold. The Prophecy of Bees had a straightforward, although predictable ending and the characters were quite likeable, so that was an improvement. This time though, it was the plot that left me cold. This story is about a troubled teenager, Isabella, and her mother, Lady Lindy Someone-or-other, who move to Stagcote Manor in the middle of nowhere against Izzy’s wishes. The story is told by Izzy, who appears to be going through a goth-ey, heavy metal-ey stage with her band member boyfriend, who recently dumped her. From the beginning, the villagers around Stagcote Manor believe that the house is haunted, although they are unable to actually say so. (Their taciturn ways are part of the curse). The locals are also full of superstitions about bees and rocks and moles and dogs crossing funeral processions and just about everything else that moves. Izzy hears strange noises at night and on investigation, the bones of a child killed centuries ago falls out of a chimney. Izzy continues investigating and realises that the villagers are involved in black magic. Izzy’s mother doesn’t believe a word of the superstitions or of Izzy’s findings. For the record, I’m with Izzy’s mother. If I can’t see it, touch it, feel it, smell it or eat it, I don’t believe in it. This was my whole problem with this novel. The book is reasonably well written, the characters are mostly believable (although Izzy’s character was a bit too grown up for the bratty drop-out she was meant to be), but I just couldn’t suspend my lack of belief in the supernatural and just go along with the plot. Plus, as I said earlier, what happens is very predictable. If you like curses and magic and supernatural stuff, by all means give this book a read, you’ll probably enjoy it. But I won’t make the same mistake a third time. There will be no more RS Pateman stories for me. The Second Life of Amy Archer by RS Pateman has an ambiguous ending. If I had known this in advance, I wouldn’t have read this novel. Amy Archer was ten years old when she disappeared from a playground, after arguing with Dana, her best friend. Ten years later, Amy’s mother Beth, who is the narrator of this book, is still grieving. Beth and Amy’s father, Brian have divorced. Brian has remarried ans has step-daughters who have, in Beth’s eyes, taken Amy’s place in her former husband’s heart. Beth has consulted a great many psychics, none of whom have given her any comfort since Amy’s disappearance. On the tenth anniversary of Amy’s disappearance, Beth consults a new psychic, who gives her new information and advises her that he sees a girl with the letters ‘E’ several times in her name near to Beth. Beth discounts the psychic’s vision, but over the next few chapters his words prove true. The next few events are hard to describe, because even though I suspended my disbelief while reading the novel, they appear ludicrous when written as part of a review. A child, Esme, who appears almost physically identical to Amy and who is the same age as Amy when she went missing, becomes known to Beth when Esme’s mother, Libby visits Beth at Esme’s insistence. Esme throws herself onto Beth and calls her Mum. Beth doesn’t know what to believe. Esme believes she is Amy and that Beth is her mother. She knows things about Beth and the family that nobody outside of Beth’s immediate circle of family and friends could know. Beth wants to believe that Amy has been reincarnated as Esme, but also suspects that she could be the victim of an elaborate fraud, as Brian posted a large reward for information which would lead to Amy or Amy’s body. Beth is outraged when she learns that Brian quietly withdrew the reward many years ago. There are a great many twists and turns as Beth gets to know Esme and investigates their background. Some of the devices the author uses to manipulate the story are too far fetched to really work, but reincarnation is probably a hard theme to pull off. Beth’s character was inconsistent, a grieving mother wanting to believe psychics, but unwilling to believe what looked like hard evidence of what she had been searching for. The reader doesn’t get to know any of the other characters well enough to care for any of them. I didn’t enjoy The Second Life of Amy Archer enough to forgive the ambiguous ending.